At Drexel's Westphal College of Media Arts & Design we go about teaching design, media, and the performing arts in a different way. Our undergraduate and graduate degree programs empower students with the knowledge, skills, and confidence to succeed in highly competitive creative fields. Our programs are predominately studio based. That means small classes and hands-on learning. We start with a very special faculty, with teachers who have worked at the top of their fields: winning Emmy Awards, designing for top fashion houses, creating art that's exhibited in the world's great museums, and as leaders of major cultural organizations and media companies. They bring real life know-how and industry contacts to the classroom but, most importantly, they bring a passion for teaching. We encourage students to build upon what they're learning in classes by participating in college enterprise... working with bands signed to our MAD Dragon Records label, creating our lifestyle magazine D&M, staging a fashion show with top professional models, producing for our television station, tackling interior design projects for major regional developers, doing research on a government or industry sponsored Digital Media project, or working for our student-run Graphic Design firm. Drexel University is one of two universities in Philadelphia to be ranked in the top 100 by US News & World Report and we believe in a well-rounded education in the humanities and sciences beyond the rigorous course of studies offered in our nationally-ranked and accredited programs. We're an urban school in a great American city, and our faculty and students are actively engaged in Philadelphia's rich cultural and civic life. Since 1919, Drexel University has been a cooperative educational institution, an amazing program you may not be familiar with. Co-op means all of our undergraduates work six months at a job in their chosen field as part of their Drexel education. We extend to you an invitation to visit Drexel to learn more about how we send our graduates out in the world with tremendous portfolios... impressive resumes reflecting real work experience... an ability to create, to reason and to use technology... and often with jobs lined-up well before graduation. Our curriculum integrates studio education and experiential learning with the study of aesthetics, function, history, ethics, technology, economic realities, and the importance of addressing the pressing issues of our times. Though our college enrollment now exceeds two thousand, we seek to maintain an individualized approach to our students’ education. Our academic programs are rigorous, and provide the appropriate balance of a solid foundation with individual creative direction, cultural awareness, strong technical skills, and an understanding of management and professional practice. We are committed to a continual review of our curricula, processes and outcomes in order make those improvements and refinements necessary to further enrich our students’ education, and to continue to foster independent thinkers, astute leaders, and creative problem solvers. 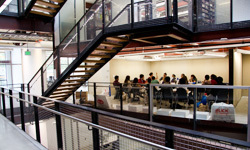 The Westphal College of Media Arts & Design is academically accredited, as part of Drexel University, by the Middle States Commission on Higher Education (MSCHE). Additionally, the programs in art, design and media are accredited by the National Association of Schools of Art & Design (NASAD); the architecture program is accredited by the National Architectural Accrediting Board (NAAB), and the interior design program by the Council for Interior Design Accreditation (CIDA).